Tourmaline is a semiprecious stone that is highly prized. Black Tourmaline is the common variety of Tourmaline. Tourmaline, can be found in such a wide range of colors that it has been referred to as the rainbow gemstone. In addition to being found in many individual colors, Tourmaline has also been found displaying multiple colors together within one crystal. Watermelon Tourmaline refers to Tourmaline that exhibits both green and pink colors within the same stone. Tourmaline can be found all around the world including Brazil and Madagascar. 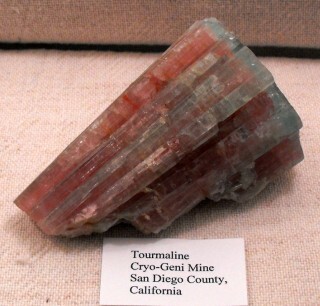 In the United States, Tourmaline has been found in California, Maine, and North Carolina.